MAKING WAVES. Senior Anna Peterson races through the pool at the UIC Natatorium. She com- petes for the Chicago Wolfpack Aquatic Club, and is ranked 20th in Illinois for her age group. Some athletes at U-High excel outside the boundaries of school sports. While they might sacrifice valuable time in school or the chance to compete for the school teams, these elite athletes are shaped by their commitment. Six days a week during the school year. Twelve hours per week during the summer. This is the amount of time Anna Peterson practices swimming, and because her day is packed with school, homework and family time, swimming occupies most of what’s left over. This immense amount of time is dedicated to intense training to become a better swimmer, and it has set the stage Anna to perform extremely well at state-wide competitions. 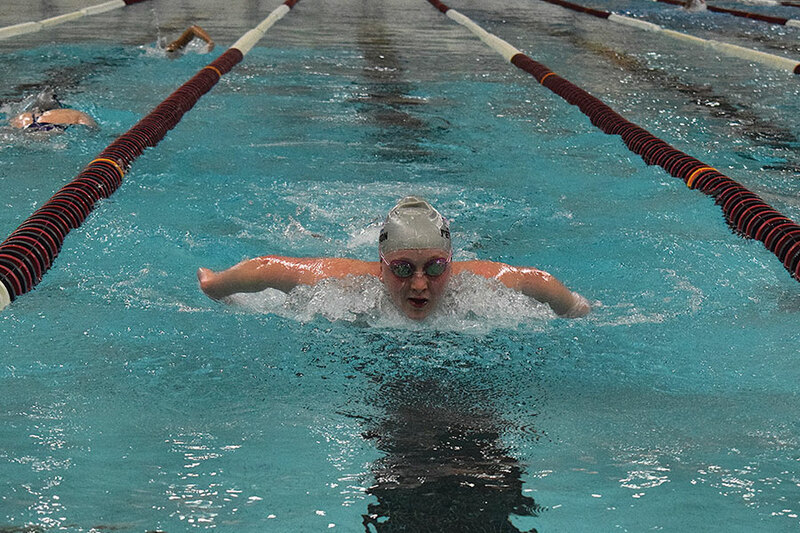 Extensive training from a young age, combined with an ability to sacrifice time to be social, has made it possible for Anna Peterson, now a senior, to flourish as a swimmer. At first, swimming was for comfort. Whenever Anna was in the water, she always seemed to find herself happy. Her parents knew this, and whenever she was upset, they got her in the water as soon as possible. When the Midway Aquatics swimming group opened at Lab it was the perfect opportunity for Anna to begin a close connection with the sport. Anna currently swims for the Chicago Wolfpack Aquatic Club. Her club swimming coach, Dave Gass, has been instrumental in Anna’s success. “We get along really well and, yeah, I trust everything that he does and I definitely have succeeded really well with his training,” Anna said. While training has not been easy, her hard work has paid off. Anna is ranked 20th in Illinois among senior girls, and in 2016 she had the second-fastest 100m butterfly for her age group. She is content with her recent performances at Speedo Sectional Championships, Speedo Future Championships and the Speedo Winter Junior National Championships. However, the place she gets in events is not what matters in her mind. Anna explained that since the competition she faced can range greatly in swimming ability, placement in events is extremely relative. Therefore, the most valid way to measure swimming performance are the times. While swimming has brought Anna happiness and success, she has also been forced to sacrifice a great deal in order to reach her current level. Since she spends so much time in the water, she does not have time for other activities, such as socializing with friends. She explained she has gone to very few of her grade’s social events purely due of a lack of time. However, these sacrifices are done for something truly special. Patience. Teamwork. Friendship. Strategy. Fencing taught Sarah Lurye all of these qualities, becoming a fact of life for her. Sarah, a sophomore, has fenced for six years and currently trains at Windy City Fencing in Lincoln Park five days a week. Sarah wants to compete in NCAA collegiate fencing, and she hopes to compete in the Olympics. Ranked 6th in the nation for the under-17 category, Sarah was put on the USA traveling team. With the team, she traveled to three cadet international tournaments. She also travels to competitions around the U.S. each month. READY TO SPAR. Sarah Lurye practices her fencing stance. Sarah has been fencing with Windy City Fencing for six years, and is ranked sixth in the nation for fencers under age 17. Her fencing career has taken her across the world for tournaments. Because she travels the world for competitions, Sarah has met some of her best friends because of fencing. At Windy City Fencing, Sarah has formed bonds with teammates like Nick Levitt, a freshman, who considers Sarah to be a supportive teammate and friend. Because she goes to so many competitions, Sarah misses school every couple of weeks, making it difficult to participate in some school activities. Even if she has to miss school, fencing is worth it to Sarah. She loves representing the United States at international tournaments. At the USA Fencing National Championships in Salt Lake City in July 2017, Sarah won each timed round by mere seconds. Sydney Rogers dives after the ball, falling to the floor, and watches from the ground as it rises over the net and out of bounds. She slaps the floor and immediately her teammates are there to help her up. They laugh it off, high five, and get back in position, ready to receive the next serve. Sydney, a sophomore, and her sister Erin, a junior, began playing volleyball three years ago and have continued through high school. It has become a large commitment for both of them and has shaped their social and athletic circles. PRACTICING FOR PERFECTION. 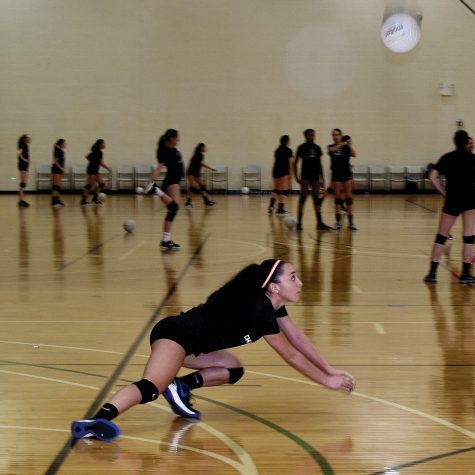 Lunging toward the ball, sophomore Sydney Rogers practices at Chicago Elite in February. Sydney practices over 15 hours each week. The sisters play for different divisions within their competitive volleyball club, Chicago Elite. Volleyball has taught them valuable lessons about time management and what it means to be a member of a team. Erin especially has taken advantage of the management skills volleyball has given her. The sisters also play for the U-High volleyball team, but club play is where they feel they get the chance to really shine. Although club volleyball takes a lot of time out of their schedules, which can be seen as a sacrifice, both of the sisters made it clear that volleyball has made them become better students and team members Because both sisters spend around 15 hours per week and sometimes up to eight hours per Saturday on the court their club teams have become like family. Erin said her team has been forced to come together. Although Erin and Sydney are both dedicated to volleyball, they are thankful for what it has given them in high school even though they know the sport doesn’t have a large role within their futures. Most importantly volleyball has shaped the sisters’ attitude toward life. “You just need to keep a positive attitude because a negative one brings down all the people around you,” Erin said.